everything is perfect for my two nights,only thing the hostel should take more care is the showers,no hot water i tried in different hours,one of the showers was blocked. This is one of the best hostels I ever stayed. 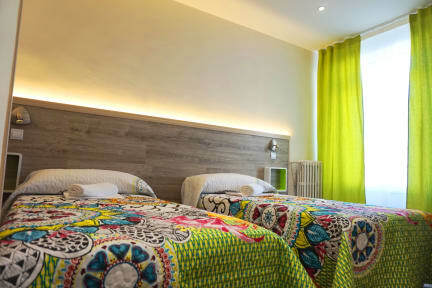 Nothing bad to say except that the atmosphere is most of the hotel than a hostel. This is not a negative point though! Great hostel in a stellar location! The staff was really friendly and helpful with getting my laundry done (just 8 Euros). There is a lot to see and do within walking distance. The free breakfast was basic, but good. The atmosphere is not great for meeting other travelers, but that was perfect for me after being on the road for so long. I would definitely stay again if I return to Madrid. Hotel more than a hostel, I enjoyed my staying here, close to everything, and I had very quiet sleeping. It's not the place to meet people, It just a small beautiful hotel. Clean, centrally located hostel that functions more like a mini-hotel with shared rooms and bathrooms than the other hostels I've stayed in. The only real common area is a small kitchen. If you want to meet other travelers, this probably isn't the place. 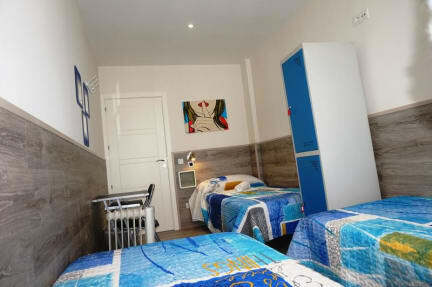 If you need a cheap, clean place to sleep, I'd recommend MuchoMadrid. Very comfortable bed. Dorm had four single beds, not a bunk in sight which was a nice change! Feels like a cheap hotel, only common space was the kitchen area. Suited me well as a quiet place to rest, but if you look for a hostel where you'll meet people maybe not for you. Limpio. Buena ubicación. Buen desayuno. Espacios demasiado pequeños, duchas muy pequeñas. Es regular. Jamás un hostal excelente.